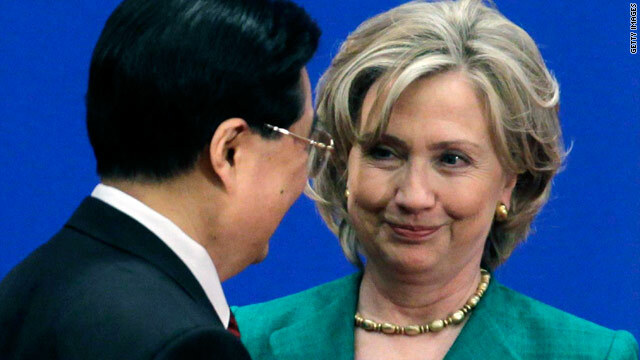 Beijing, China (CNN) -- China and the United States kicked off two days of high-level talks Monday -- with U.S. Secretary of State Hillary Clinton asking Beijing to support sanctions against North Korea, and Chinese President Hu Jintao showing a willingness to reform the yuan but offering no timetable. Both sides agreed that the Strategic and Economic Dialogue is meant to come up with "win-win solutions, rather than zero-sum rivalries," as Clinton put it at the opening of the talks. But it is unclear how much progress the two countries will make on thornier issues, of which there is no shortage. In her opening day remarks, Clinton praised China for supporting tough United Nations sanctions against Iran and said the same level of cooperation was needed against North Korea. On Monday, the White House said it supported South Korea's decision to suspend trade and toughen military stance toward North Korea after an official investigation determined that North Korea fired a torpedo on a South Korean warship, killing 46 sailors. "Last year, we worked together to pass and enforce a strong U.N. Security Council resolution in the wake of North Korea's nuclear test. And today we face another serious challenge, provoked by the sinking of the South Korean ship. So we must work together, again, to address this challenge and advance our shared objectives for peace and stability on the Korean Peninsula," Clinton said. But China is the reclusive North's closest ally. Earlier this month, it hosted North Korean leader Kim Jong Il on a rare trip abroad. It has called the navy ship's sinking "unfortunate" but has not commented beyond saying that peace needs to be maintained in the Korean Peninsula. The economic part of the dialogue poses its own challenges. The U.S. wants China to provide more access to its markets for American exports and allow its currency, the yuan, to appreciate. But with the economic crisis in Greece spreading to other countries in Europe and sinking the euro, China is reluctant to do so. Hu said Monday that China will steadily push forward yuan reform but did not provide additional details. China has kept its yuan about 6.83 to the dollar for almost two years. Many U.S. economists say the currency is undervalued by as much as 40 percent. Keeping its currency low makes China's goods cheaper on the world market and more likely to be purchased by other countries. But, analysts say, it hurts American businesses, which cannot then compete. Chinese officials have insisted the United States is using Beijing as a scapegoat for its own economic problems. "China will continue to steadily push forward reform of the yuan exchange rate formation mechanism in a self-initiated, controllable and gradual manner," Hu said. The U.S. is also concerned about China's censorship of the internet. The situation in Afghanistan will also be high on the agenda, as China is a major donor there. The Chinese have plenty of their own complaints, including Obama's recent meeting with the Dalai Lama and U.S. arms sales to Taiwan, which infuriated Beijing to the point of threatening sanctions against U.S. companies taking part in the arms package. On Monday, Hu said each nation must "respect each other's core interests and major concerns" including "sovereignty, independence and territorial integrity" which he called "a country's most basic rights." He said there is nothing more important to the Chinese people than "safeguarding national sovereignty and territorial integrity." More than 200 officials from President Obama's administration are accompanying Clinton for the two-day talks. Assistant Secretary for East Asia Kurt Campbell called it one of the largest groups of Cabinet and sub-Cabinet officials from the United States ever to visit China. The group includes "virtually all elements of the U.S. government," Campbell said. Kirk, USAID Administrator Rajiv Shah, Federal Reserve Chairman Ben Bernanke and Christina Romer, chairwoman of the president's Council of Economic Advisers. Key players from the Pentagon and U.S. Pacific Command are also there. The meeting is a follow-up to the first Strategic and Economic Dialogue established by Obama and Hu in April 2009 in Washington, where the Chinese delegation was just as large.